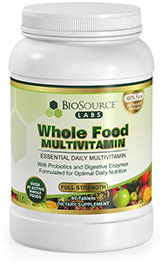 BioSource Labs Whole Food Multivitamin is a perfect blend of essential vitamin, minerals, and whole foods that performs best when taken with a healthy diet. This multivitamin is approved for use during the Complex Diet Drops diet program. It provides fantastic nutritional support during the diet and as a maintenance product, helping to give the body a full spectrum of necessary daily vitamins and minerals that you may lose during the low calorie diet. To achieve the full benefits of this nutritional powerhouse, you’ll want to make sure you’re eating healthy and drinking plenty of water. Whether you’re in the middle of your diet or just want a complete source of daily nutrients, this multivitamin can provide some incredible health benefits when taken consistently on a daily basis. Stop spending money on unnecessary individual vitamins. Our scientists have carefully formulated this balanced combination of all natural ingredients to deliver much of what your body needs in one tablet. By taking three whole food multivitamin tablets daily with meals, you won’t have to worry about taking an array of different vitamins for various purposes. With so many beneficial whole food vitamins and minerals potently packed into 3 tablets per day, the BioSource Labs Whole Food Multivitamin should be an essential part of everyone’s daily regimen. Rest assured you are feeding your body only the best. The biggest perk of taking a multivitamin is that it’s nearly impossible to determine the precise amounts of vitamins and minerals we receive on a daily basis. So even if we’re eating healthy, we may not be getting enough of what we need to feel our best. This is where taking the Whole Food Multivitamin comes into play. By taking this simple daily multivitamin, you’ll ensure that you’re adequately meeting practically your entire body’s daily vitamin and mineral nutritional needs. You can improve energy levels to feel naturally more aware and more vibrant. You may also improve your overall mood and sense of well being by just feeling good. Folic Acid: Commonly used to both prevent and treat low folate levels and insufficient nutrient absorption. Folic acid is also used to treat and prevent: heart disease, cancer, stroke, liver disease, kidney disease, ulcerative colitis, memory loss, hearing loss related to age, eye disease, weak bones, Alzheimer’s disease and more. Folic acid is also good for hair, skin and nail health. Iron: The body needs sufficient amounts of iron for overall growth and development. Iron works to effectively metabolize the body’s much needed proteins. It plays a key role in hemoglobin and red blood cell production. Citrus Bio Complex: Contains some of the strongest flavonoid antioxidants, which help reduce inflammation, oxygenate tissue, and maintain blood normal pressure. Digestive Enzyme Blend: Help maintain healthy digestion, resulting in more efficient use of nutrients from food. Probiotic Blend: Helps to improve digestion, reduce bloating and keep you regular. Omega Blend: Flaxseed, sunflower oil, borage powder, omega-3, and omega-6 aid in the prevention of heart disease and helps to improve skin health, and improves the functions of all major body systems including the brain. Green and Whole Food Blend: Chlorella and Spirulina, along with the other few ingredients in this blend have shown to support healing, delay aging, and activate cell renewal. These have a role in significantly lowering cancer risk as well. Herb Blend: Many of the included herbs are often used to fight off common illnesses, like the cold. These powerful plants also help purify the blood and may help improve brain function. Vegetable Blend: Important vegetables that ultimately help lower your risk for heart disease, stroke, and cancer. Fruit Blend: Powerful antioxidant support which aids in keeping the body vibrant and disease-free. Helps reduce inflammation and boosts the immune system. Mushroom Blend: Shiitake, Maitake, and Reishi are widely referred to as “medicinal mushrooms”. These fungi provide astonishing immune and cardiovascular support. They offer clear anti-cancer benefits, specifically with prevention of prostate cancer, breast cancer, and colon cancer. This product should not be taken if you are allergic to dairy or wheat ingredients as it contains milk and wheat ingredients. The whole food multivitamin is an approved to be used during many different diets. It’s ideal to take while on the Complex Diet Drops protocol, during the VLCD of the hCG diet, paleo diet, keto diet. This multivitamin is beneficial for those following the Complex Diet Drops diet, both during the diet phases and following the successful completion of the diet plan. Taking this comprehensive multivitamin will help provide adequate vitamin and mineral support to keep your body and mind in optimal health. For optimum results and health benefits, consider taking the whole food multivitamin in the morning with breakfast, in the afternoon with lunch and in the evening with supper. You may wish to avoid taking the vitamin without food to avoid the possibility of an upset stomach or feeling nauseous. It’s best taken with food. By taking it in the morning you’ll give your body an important boost of natural, healthy energy so you can put your best foot forward throughout the day. It’s safe to store at room temperature when unopened. Once opened you should store in a refrigerator to ensure freshness.